The worldwide biodiversity crisis is ongoing. To slow down, or even halt future species loss it is important to identify potential drivers of extinction risk. Species traits can help to understand the underlying process of extinction risk. In a comprehensive study on 464 carabid beetle species, we used ordinal logistic regression to analyze the relationship of species traits to extinction risk in Central Europe, taking phylogenetic relatedness into account. To consider varying trait responses in different habitat types, we also tested models for species groups associated with different habitat types (forest, open, riparian and wetland). Our results identified three traits of particular importance as predictors for high extinction risk: (1) high habitat specialization, (2) small distribution range size (which is not considered in the categorization of the German Red List), and (3) large body size. Furthermore, large macropterous species showed high extinction risk. 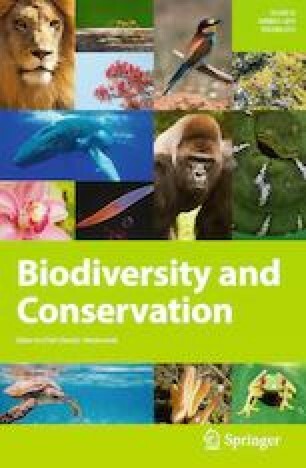 Overall, species associated with mountainous, coastal and open habitats generally revealed a high risk of extinction, while most forest species showed a low extinction risk. However, forest species with predatory feeding behavior were threatened, as were wetland species that reproduce in autumn. Phylogenetic relatedness had no influence on how species traits predict carabid beetle extinction risk. In the light of these results, management and recovery plans for species which exhibit characteristic traits strongly associated with extinction risks, as well as the conservation and restoration of mountain, coastal and open habitats, have to be prioritized. Communicated by Eckehard G. Brockerhoff. The online version of this article ( https://doi.org/10.1007/s10531-019-01724-9) contains supplementary material, which is available to authorized users. We like to thank I. Harry, P. Brandmayr and K. Homburg for helping to complete and compile the species trait dataset, as well as two anonymous referees for their valuable comments on the manuscript.